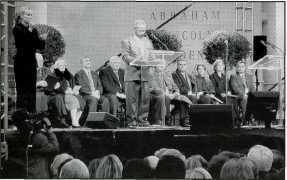 Former CNN Anchor and Broadcasting & Cable Hall of Famer Bernard Shaw addresses the crowd at the dedication of the Abraham Lincoln Presidential Library and Museum, November 18, 2002. January 1 marks the 140th anniversary of Lincoln's Emancipation Proclamation, the landmark 1863 document that led to the end of slavery in the United States. Coinciding with this anniversary, the U.S. National Park Service  in conjunction with its official non-profit partner, the National Park Foundation  has unveiled an updated "National Underground Railroad Network to Freedom" web site, devoted to preserving the famed network of escape sites, shelters, and destination sites used by individuals who resisted enslavement by escaping, while also serving as the national aggregator of local, regional, and national historical information on the topic. New York-based College Central Network  with extensive professional expertise in incorporating technology into educational environments  created the web site, provided seed funding, and now powers and maintains it. The Underground Railroad site (www.cr.nps.gov/ugrr) serves as the central online location for the National Park Service's efforts to coordinate preservation and educational efforts related to the famed nineteenth-century network. In addition, it is a venue for verification of buildings and other facilities, offering visitors a wealth of background information. Via a comprehensive online submission system, participants from around the United States can submit information and photographs online, which are gathered and reviewed by their respective National Park Service regional coordinators. The information will be carefully woven into the overall historical fabric of what could well become the largest collection of information about the Underground Railroad movement in the United States. The ISHS Illinois History Symposium Committee again invites proposals for future programs. The next Symposium will be held December 4 and 5, 2003, in Springfield. The Symposium is open to papers on any aspect of the State's history, culture, politics, geography, literature, archaeology, and related fields such as archives, historic sites, and museums in Illinois. The Committee welcomes proposals from non-professional as well as professional historians, undergraduate as well as graduate students, from anyone regardless of age or affiliation whose research is relevant to Illinois history. The 2003 theme is "The Challenges of Education and the Perils of Justice." Each proposal should include a summary of the topic and a one-page resume of the participant. The summary should specify the major primary and secondary sources used in the research. The deadline for proposals is March 21, 2003. Individuals will be notified of the committee's decision in June. Proposals should be sent to Illinois History Symposium, The Illinois State Historical Society, 210-1/2 S. Sixth Street, Suite 200, Springfield, IL 62701-1503; phone: 217/525-2781; fax: 217/525-2783; or e-mail: ishs@eosinc.com. A reproduction of the keelboat Northwest explorers Meriwether Lewis and William Clark used to take the "Corps of Discovery" up the Missouri and into history. 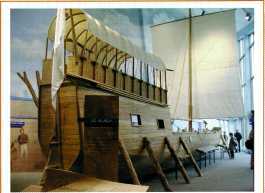 The keelboat and much more about the explorers preparations for the journey are now on display at the new Lewis and Clark Interpretive Center in Hartford, Illinois, just outside of Alton. A study of pre-Civil War violence in Illinois, the discovery of new sources related to the second bloodiest riot on the Northern home front during that conflict, and an examination of the politics surrounding the migration of Mormons to and from this state in the 1840s are among the topics to be addressed March 29 at the Third Biennial Stephen A. Douglas History Symposium. The event will be held at Rock Springs Center on the southwest edge of Decatur. "We are delighted with the important and interesting topics to be discussed at the Douglas Symposium," said Bob Sampson of Decatur, who serves on the Symposium's organizing committee. "We believe that both academic and armchair historians, as well as Civil War Roundtable members and others, will find these presentations helpful." Lead sponsor for the event, which began in 1999, is the Macon County Conservation District, which owns and operates Rock Springs. Additional support comes from the Illinois Historic Preservation Agency (IHPA), the Stephen A. Douglas Association, and the Illinois State Historical Society. The Symposium opens with registration at 8:30 a.m. and the first panel of presentations begins at 9 a.m. Keynoting the Symposium is Dan Guillory, an English professor at Millikin University, an award-winning poet and the author of three books. Guillory's topic is "Lincoln and Douglas as Suitors," focusing on how the two frontier politicians approached courtship. Several of the presenters are either published authors or have books coming out in the near future, Sampson noted. Illinois State Historian Thomas Schwartz is one of the presenters addressing violence. His paper examines dueling in Illinois before the Civil War. Peter Barry, who holds an endowed chair in agricultural finance at the University of Illinois, will discuss some 500 pages of new documents on the March 28, 1 864, riot in Charleston that left nine dead. Bryon Adreason of the IHPA and Matt Norman of the Lincoln Studies Center at Knox College will look, respectively, at the interactions of the Little Giant and the Railsplitter with Mormons and the men's view of the 1848 revolutions that convulsed Europe. Graham Peck of Xavier University will discuss the challenges faced by Douglas in his final quest for the presidency between 1858 and 1860. Dan Monroe of the Lincoln Legals Project will speak on how Douglas and his peers viewed territorial expansion of the United States in the 1840s and 1850s. Bruce Tap, an independent scholar from Grand Rapids, Michigan, will focus on how the concept of masculinity affected the work of the Committee on the Conduct of the War during the Civil War. Registration for the Symposium is $20 and includes lunch and breaks. Those wishing to register or learn more should contact Brent Wielt at 3939 Nearing Drive, Decatur, Illinois 62521, (217) 423-7708, e-mail: bwielt@macon-countyconservation.org .